I wish you a beautiful Monday morning and a successful start into a new week! You would never look at it, but Mick Jagger turned 75 on 26 July. Three quarters of a century of rock history and beautiful wrinkles. 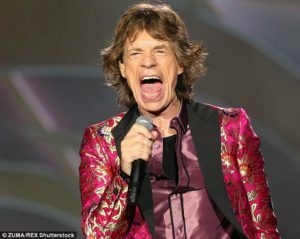 Sir Michael Philip Jagger, from Dartford, Kent County, UK, continues to give us music and style lessons. Few indeed know how to deal with him as he grows older: maintaining a dry boyish physique and a unique grace, even in his marked face. Today looking at him you can still see the boy with a disturbing, provocative beauty, often half-naked in the prime of the years. Past (almost) unharmed through a life of excesses and marriages (failed), Mick celebrated his last birthday with some of his eight children. Georgia May , born in 1992, has posted on her Instagram profile a forum to remember the day, accompanied by a declaration of love. “Happy Birthday Dada! We love you “. Jagger was married to Bianca Pérez, with Jerry Hall and then was linked to L’Wren Scott. He had 8 children: Karis (with singer Marsha Hunt, 1970); Jade (with his first wife Bianca Jagger, 1971); Elizabeth (1984), James (1985), Georgia (1992) and Gabriel (1997) (with second wife Jerry Hall); Lucas (with model Luciana Gimenez, in 1999). He has 5 grandchildren and on 19 May 2014 he became a nerd: his niece Assisi, daughter of Jade, gave birth to a girl named Ezra Key. On December 8, 2016 he became a father for the eighth time at the age of 73, when his girlfriend, Melanie Hamrick, gave birth to a child named Deveroux. 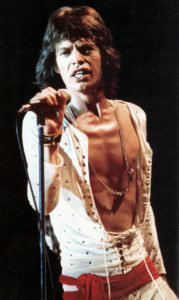 I want to dedicate her version of Jagger’s “Ruby Tuesday” 1971 to him today and wish him another 75 years of Rock & Roll! Maroon 5 – Moves Like Jagger ft. Christina Aguilera. I wish you a happy Monday and come back very soon with a new story.